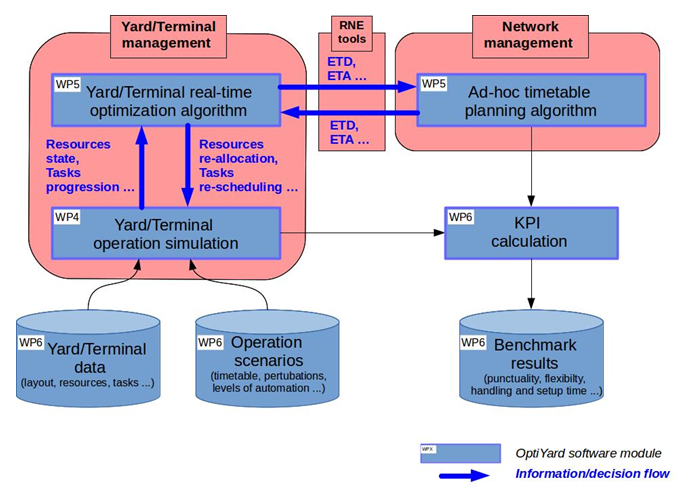 To meet the needs of S2R and Horizon 2020, OptiYard will design optimised processes for managing marshaling yards and terminals, considering their interaction with the network. The processes considered are those that must be performed in real-time, to guarantee on-time delivery and operational efficiency, for single wagon transport. OptiYard addresses critical operational points of the transport chain (both rail marshalling yards or as transfer points to other modes) to improve capacity and reliability. Most importantly, these improvements will enhance competitiveness whilst increasing service reliability and customer satisfaction by providing accurate and updated information. Real-time interaction between yard and relevant network IT systems will allow for software based planning and ultimately optimisation of single wagonload and blocktrain operational processes. If rail is to play an increasing role in sustainable European freight transport, the freight network will need to offer enhanced connectivity between key EU transport corridors and hence there will be need to manage increasing numbers of train movements and shunting operations through freight marshalling yards at strategic locations. OptiYard will provide enhanced decision support that can be directly applied to achieving enhanced yard capacity and efficiency. The lack of full integration between yard and network is a current weakness, and one that increase as more real-time data becomes available, because we will miss the opportunities to realise the benefits of such improved data. Hence, there needs to be much more progress in developing the integration of information systems and control systems between the yard systems and the network systems. It is in this field where OptiYard offers the most exciting possibilities. Large rail freight marshalling yards are complex operations which present major challenges to achieving operational efficiency, such that managing them effectively even in a stand-alone mode is a challenging task, for which sophisticated scheduling systems are required. The arrival and departure of freight trains to/from the yard are closely linked to the operations of the wider network eco system, making some of the yard operation processes (shunting, marshalling and departing train dispatches) more time-critical than others. Thus, a key challenge to the future success of yard management lies in the real-time information exchange between the yard and the relevant network eco system, and the interactive responses between the yard and the network managements. With such information capabilities, yard operations could be rescheduled at short notice to take account of perturbations on the network, such as the delayed arrival of an incoming freight train, allowing rapid re-optimisation of yard operations. Real-time network information could also be used to identify more accurate departure times for trains leaving yards, again allowing for beneficial rescheduling of yard operations. Hence, we develop a holistic approach to providing a real-time decision-making framework for optimising yard operations and the yard-network interface. 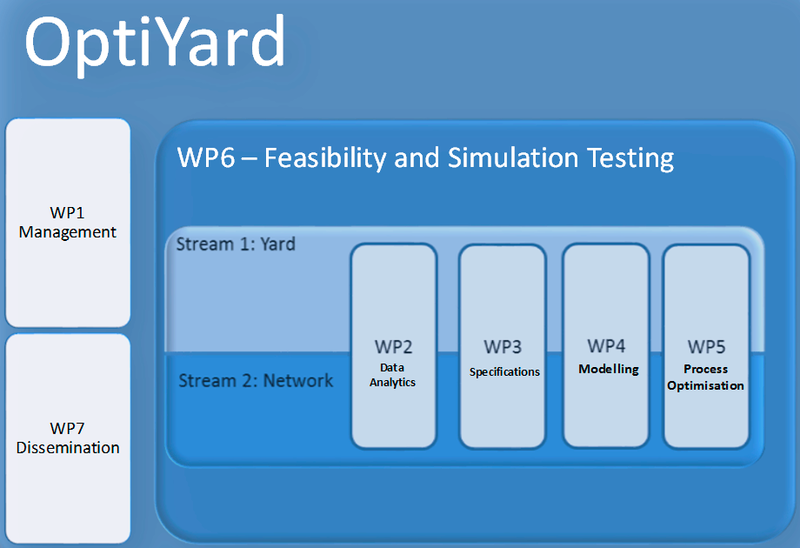 Simulation software will be used to produce a yard model which will be validated and tested in a real world environment using a multiple-method approach; e.g. outputs from simulation will be compared with data collected from the real operations, validation through statistics, KPIs and MoPs, external reviews and expert evaluations. Optimisation algorithms will be developed to suggest better practices for improved information and communication channels in freight yards and networks. Specifically, these will include: a yard optimisation algorithm, an ad-hoc network timetable planning approach an algorithm for simulation-optimisation integration followed by an optimization procedure for yard-network integration in real-time. OptiYard Decision Support System – This system comprises the tools that we will develop and make available to actors to enable them to make optimal decisions in real-time, and allowing for an increasingly digital railway and an increasing level of automation in future yard operations. OptiYard KPI – The classical KPI for marshalling yard capacity is the number of trains that can be marshalled per track during a day. This KPI is computed by averaging the number of marshalled trains in a month. However, it has to be taken into account that this number depends not only on the capacity, but also on the experienced demand. The overall structure of the technical work packages, which depend heavily on WP2 to define the baseline model for further development, particularly in WP2 and WP3. The other technical work packages will build on the findings of WP2 to deliver output that will meet the objectives as stated in the work programme. This project has received funding from the Shift2Rail Joint Undertaking under the European Union’s Horizon 2020 research and innovation programme under grant agreement No 777594.